The more we hear about the possible Beetlejuice sequel, the more we can't help but get excited in spite of all the dread. And now it sounds like Burton and company are keen on getting the Beetlejuice band back together, and that includes Lydia Deetz. Michael Keaton (the original ghost with the most) has previously declared his desire to reprise his role as Beetlejuice. And last we heard Pride and Prejuduce and Zombies author Seth Grahame-Smith was pretty far off of this project (only admitted that he had tossed around big ideas for the script not much else). But original film director Tim Burton has teased out a small update, that gives us hope that if Beetlejuice 2 ever does see the light of day, it will be made up of the original cast members and original creators. In an interview with MTV News, Burton was asked about the state of the Beetlejuice 2 script, to which he said "there is only one Beetlejuice, for sure. And it's pretty good." And then began talking about how he hasn't been able to get in touch with Keaton recently (because Keaton is on his awards campaign from Birdman). But we're reading in an implied, "this is good and we're not going to make it with anyone else" aura being projected from that exchange. Which whew. Burton was then asked if he would be interested in directing the sequel and he replied with an emphatic, "Oh yeah." 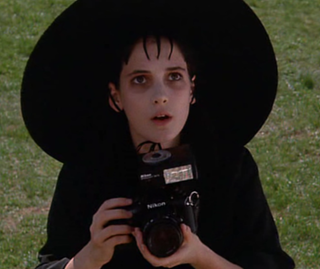 And pressed about whether there would be a role for Winona Ryder (the Lydia Deetz) Burton replied with a very excited, "Oh yeah, yeah yeah yeah. Oh yeah, oh yeah. Yeah yeah, oh yeah." Dammit now we're excited, too!